The finished piece will be premiered by soprano Jamie Jordan, a versatile and much sought-after interpreter of new music, and Daniel Druckman, associate principal percussionist in the New York Philharmonic and director of percussion studies at the Juilliard School. 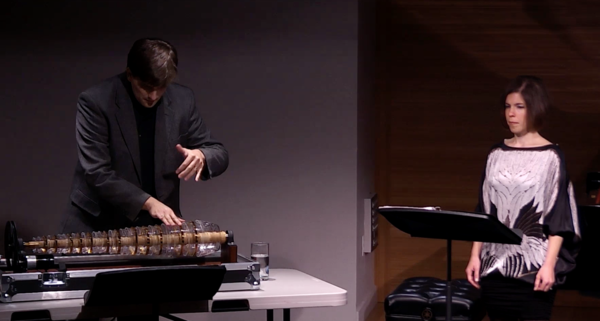 Liberatore will join Jordan and Druckman on the glass harmonica, a rare instrument that he acquired last year through a Faculty Research Support Program Initiation Grant. When completed, the work will be recorded as part of an album of Liberatore’s works slated for release on Albany Records in 2018. At the Millay Colony, he will also dedicate time to a commission from Korean-American pianist Eunmi Ko for a concert honoring the 100th birthday of composer Isang Yun at the Seoul Arts Center in September 2017. Located near Austerlitz, New York at the former home of poet and activist Edna St. Vincent Millay, the Millay Colony was established by her estate in 1973. The colony aims to “nurture and promote the vitality of the arts” by offering competitive residencies to artists of all disciplines from around the world. Professor Liberatore has taught at Notre Dame since the fall of 2015. Originally published by Noelle Elliott at music.nd.edu on January 23, 2017.